Born in Boston on January 17, 1706, Benjamin Franklin was the tenth son of a soap maker, Josiah Franklin. His mother, Abiah Folger, was the second wife of Josiah, and in all they had 17 children. Franklin’s father intended for him to enter into the clergy, but Josiah could only afford to send his son to grammar school for a single year at age 8, and members of the clergy needed many years of schooling to qualify. However, Benjamin Franklin was apprenticed by his father to his brother James, who was a printer. Franklin helped James in composing pamphlets and set type, and between the ages of 10 and 12 years old, sold their products in the streets. He continued his printing apprenticeship under his brother, who later founded the first newspaper in Boston, the New England Courant; In 1721, Franklin published his first article there, anonymously and went on to pen satirical articles that poked fun at the people of Boston. After a while, Benjamin Franklin became unpopular and wore out his welcome, both with his brother and with the population of the city. At 16, Franklin ran off to New York and then on to Philadelphia, while looking for printing work. He gained a commission to Europe to buy supplies needed to establish a new printing house in Philadelphia, but instead, found himself abandoned when he arrived there. Franklin worked hard and lived frugally to buy his fare back to Philadelphia in 1732 and set up shop as a printer. In 1736, Franklin was appointed clerk of the Pennsylvania Assembly, and as Postmaster the following year. He began publishing Poor Richard’s Almanac in 1741, which became a very popular and influential magazine. In 1751 he was elected to the Pennsylvania Assembly and served as an agent for Pennsylvania to England, France and several other European entities. He was elected to the Continental Congress in 1775, where his role was crucial in the rebellion against Great Britain, including service to Jefferson in editing the Declaration of Independence. By this time, Benjamin Franklin had become an independently wealthy individual and retired from publishing. He continued to serve an important role in both local and national government. He became the United States’ first Postmaster General, Minister to the French Court, Treaty agent and signer to the peace with Great Britain, and Celebrated Member of the Constitutional convention. Though Benjamin Franklin did not receive any education beyond the age of ten years old, he held the positions of: businessman, writer, publisher, scientist, diplomat, legislator, and social activist, and was one of the earliest and strongest advocates for the abolition of slavery, and for the protection of the rights of American aboriginal peoples. 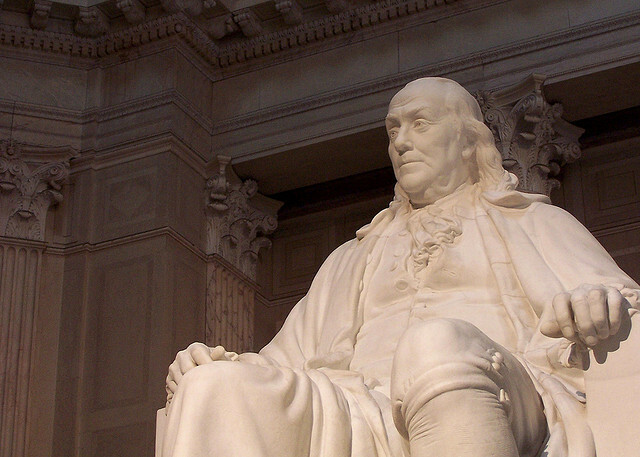 On April 17, 1790, Benjamin Franklin died as one of the most celebrated characters in American History.